Failing to meet climate mitigation goals laid out in the U.N. Paris Agreement could cost the global economy tens of trillions of dollars over the next century, according to new Stanford research. The study, published in Nature, is one of the first to quantify the economic benefits of limiting global warming to levels set in the accord. The agreement commits 195 countries to the goal of holding this century’s average temperature to 2 degrees Celsius above levels in the pre-industrial era. It also includes an aspirational goal of pursuing an even more stringent target of limiting temperature rise to 1.5 degrees. To date, the economic benefits of achieving these temperature targets have not been well understood. 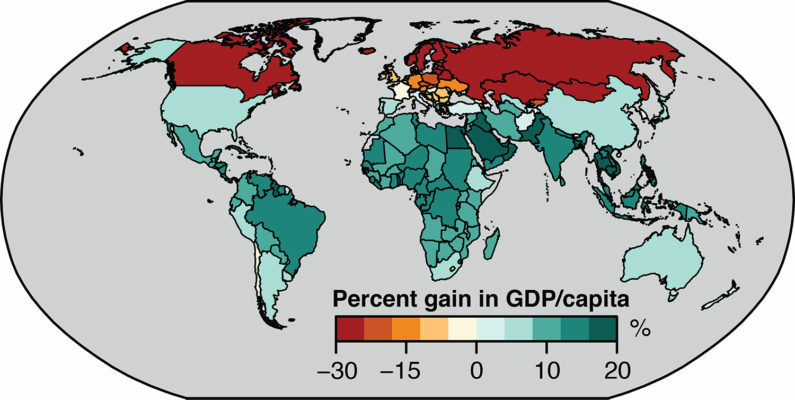 Percentage gain in GDP per capita in 2100 from achieving 1.5 degrees Celsius global warming instead of 2 degrees. “Over the past century we have already experienced a 1-degree increase in global temperature, so achieving the ambitious targets laid out in the Paris Agreement will not be easy or cheap. We need a clear understanding of how much economic benefit we’re going to get from meeting these different targets,” said Marshall Burke, assistant professor of Earth system science in the School of Earth, Energy & Environmental Sciences and lead author of the study. To develop this understanding, a team of Stanford researchers studied how economic performance over the past half-century correlated with changes in temperature around the world. Then, using climate model projections of how temperatures could change in the future, they calculated how overall economic output is likely to change as temperatures warm to different levels. The researchers found a large majority of countries – containing close to 90 percent of the world’s population – benefit economically from limiting global warming to 1.5 degrees instead of 2 degrees. This includes the United States, China and Japan – the three largest economies in the world. It is also true in some of the world’s poorest regions, where even small reductions in future warming generate a notable increase in per capita gross domestic product. The projected costs from higher temperatures come from factors such as increases in spending to deal with extreme events, lower agricultural productivity and worse health, the scientists said. Previous research has shown that the actual climate commitments each country has made as part of the Paris Agreement add up to close to 3 degrees of global warming, instead of the 1.5-2 degrees warming goals. Given this discrepancy, the researchers also calculated the economic consequences of countries meeting their individual Paris commitments, but failing to meet the overall global warming goals of 1.5-2 degrees. They found that failing to achieve the 1.5-2 degrees goals is likely to substantially reduce global economic growth. “It is clear from our analysis that achieving the more ambitious Paris goals is highly likely to benefit most countries – and the global economy overall – by avoiding more severe economic damages,” said Noah Diffenbaugh, professor of Earth system science and paper co-author. The authors note the study may underestimate the total costs of higher levels of global warming. That’s especially true if catastrophic changes such as rapid melting of the ice on Greenland or Antarctica come to pass, or if extreme weather events such as heatwaves and floods intensify well beyond the range seen in historical observations. A recent study by Diffenbaugh and his colleagues showed that even with reduced levels of global warming, unprecedented extreme events are likely to become more prevalent. The new research helps shed light on the overall economic value of the Paris Agreement, as well as on the Trump administration’s decision to withdraw the U.S. from the accord because of concerns that it is too costly to the U.S. economy. The researchers calculated that the overall global benefits of keeping future temperature increases to 1.5 degrees are likely in the tens of trillions of dollars, with substantial likely benefits in the U.S. as well. They note that these benefits are more than 30 times greater than the most recent estimates of what it will cost to achieve the more ambitious 1.5 degrees goal. “For most countries in the world, including the U.S., we find strong evidence that the benefits of achieving the ambitious Paris targets are likely to vastly outweigh the costs,” said Burke. Burke is also a fellow at the Center on Food Security and the Environment, the Stanford Woods Institute for the Environment and the Freeman Spogli Institute for International Studies. Diffenbaugh is also the Kara J Foundation Professor, the Kimmelman Family Senior Fellow in the Stanford Woods Institute for the Environment and an affiliate of the Precourt Institute for Energy. Additional co-authors include W. Matt Davis, a former researcher at the Center on Food Security and the Environment. The research was supported by the Erol Foundation.